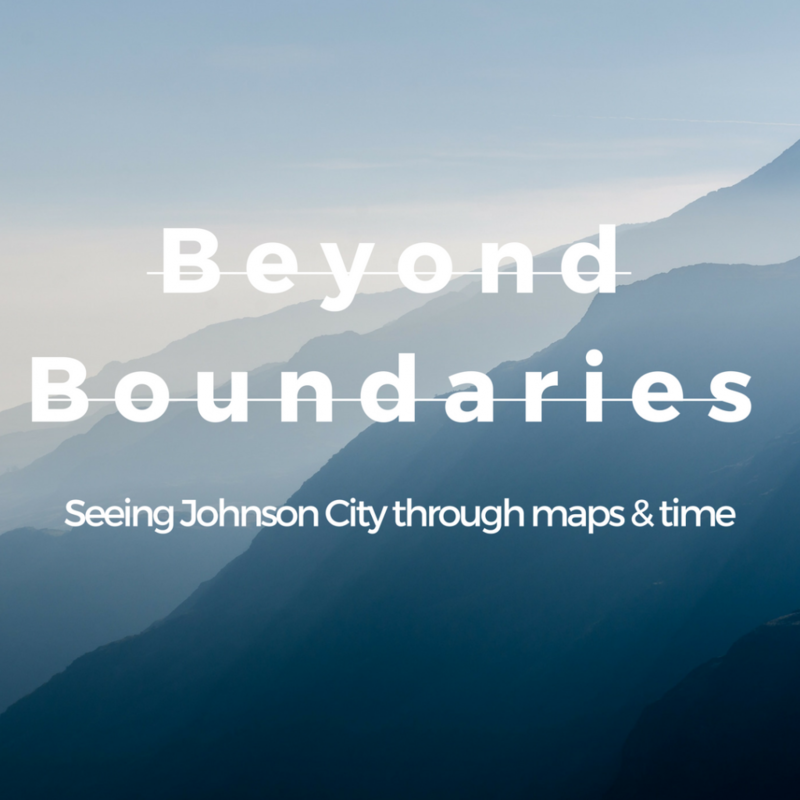 We just installed a new educational display in cooperation with the Johnson City Geographic Information Services (JCGIS) titled Beyond Boundaries: Seeing Johnson City Through Maps and Time. Beyond Boundaries is a new exhibit looking at Johnson City’s development through maps, photography, & urban planning. We currently have 3 map displays showing annexation and the city center’s movement, an early city general plan, and the library’s development & movement over our history. This display can be seen at the top of the stairs in the library. David Ownby, Technical Services Manager at the Johnson City Public Library, has been instrumental in creating the display. 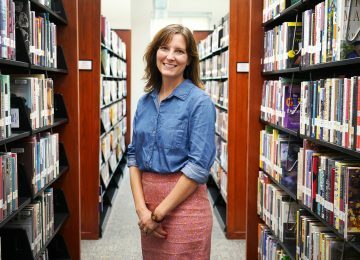 “In the fall we had a a Leadership 2020 group from the Chamber of Commerce tour the library. 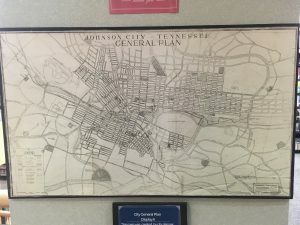 During the tour, Link Elmore, the Geospatial Project Manager JCGIS and I began talking about making some of their maps available to the public.” The current maps will remain on display through May, when we will begin featuring a “map of the month” in conjunction with JCGIS. These will be smaller displays that examine one specific measure of historical or cultural value. Additionally, the library and JCGIS hope to create programming together, including showing how maps are constructed. 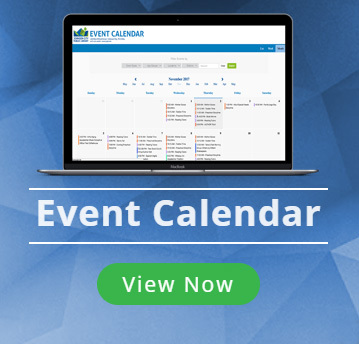 David continues, “when I worked at a government documents office we had lots of questions about what exactly it was that we did and what our purpose was. 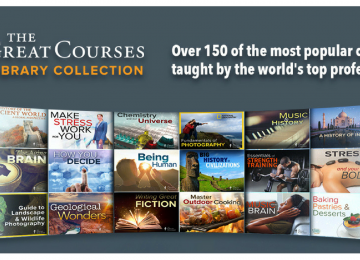 I hope that this will help to answer some of those questions. 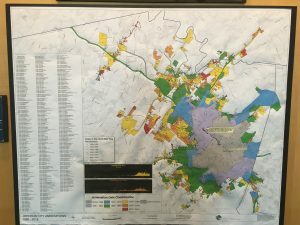 There’s a lot of diversity within government documents, but it’s a lot easier to understand with a visual medium like a map.” He adds that this information combined with other government documents, like census data, can be very useful for historical or business research as well. 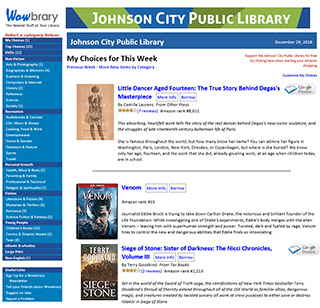 For more information about Beyond Boundaries or other displays or services offered by the Johnson City Public Library, call us at 423-434-4450.